Synopsis: John and Ella Spencer have almost reached the end of the road; Ella is frail, while John's memory is failing. Instead of going quietly into that good night, however, the Boston seventysomethings flee the suffocating care of their doctors and children, and hop aboard their vintage campervan, nicknamed The Leisure Seeker, to visit the Florida Keys house of John's hero, Ernest Hemingway. I never thought that one day I would make a film in another country, in a language which isn't mine, and I'm still wondering why it happened. Let me recap the creative and the production processes of The Leisure Seeker, starting a few years ago when first one film of mine, and then another, were chosen to be the Italian Entry of that fun and slightly surreal merry-go-round, the campaign to win an Oscar® in the Best Foreign Language Film category. Since both films had been distributed in the United States and had also obtained some praise, I received a number of offers to shoot a movie in the States but I always hightailed it back to Italy. In general, the scripts had already been written – in full or in part – and, quite frankly, I wasn't very interested in the projects, which furthermore might never have seen the light of day. My friends at Indiana Production, who had been by my side during that adventure, couldn't reconcile themselves to this; they didn't understand why I wouldn't accept. So I made them a promise: if we find an idea that tickles our fancy, maybe something out of a book, and if I can work the way I'm used to working, that is, I start by writing the screenplay, then I'm ready to reconsider the idea. A flood of boxes full of American novels and short stories began to arrive from the Indiana Production offices. Including this novella by Michael Zadoorian, the story of an elderly couple who escape the Detroit suburbs in their old camper and drive to California along legendary Route 66. I found something very appealing in this: a subversive spirit, rebellion against a hospitalisation which is being forced on them by doctors, their children, and social and medical regulations. But at the same time, it seemed to me that this trip retraced a landscape which has already been seen in many other good movies. There was the risk of getting ensnared in clichés, like American directors sometimes do when they are shooting in Italy and end up framing touristy and picturesque spots. So I set it aside and dedicated myself to something else: another Italian movie, in Italy. A while later, my friends Francesca Archibugi and Francesco Piccolo – amazing writers and adorable people with whom it is wonderful to write together – tried to convince me to think it over and proposed that we use the book as a cue but change the trip's itinerary and, consequently, the socio-cultural profiles of the characters: a retired literature professor from New England, with a younger wife from South Carolina, on their way to the Hemingway House in Key West. So we tried dashing off a few scenes and some dialogue in Italian and then, with the precious help of my novelist friend Stephen Amidon, we transformed them into American English in the first version of the script. I remember a sort of commitment escaping from my mouth: if Donald Sutherland agrees to play the role of John and if Helen Mirren will play Ella, then I swear I will make this movie. But I was just shooting a line, covering my back, to avert the possibility of having to make this American project which my producer friends and co-scriptwriters were fanatically supporting. But destiny wrong-footed me: unexpectedly, and I still can't figure out how it happened, Mirren and Sutherland accepted. A few weeks later, we were already on the set; I virtually didn't have time to put what was happening into focus and there we were, deep in preparations, bringing along half an Italian crew and all our habits, including – for better or worse – our way of seeing things and making movies. I certainly hadn't crossed the ocean to become an "American director." But, working with a sublime actress like Helen and an authentic legend like Donald was not only electrifying, it was also very instructive. I was spellbound watching them perform together; he is intense and regal, but also funny and unpredictable; she is sharp, wise, very witty and suddenly full of ardour, rage, pain. I had a hard time saying the word "cut!" Maybe it was, above all, so I could enjoy the pleasure of sharing an experience with two artists who fascinate and move me that I packed my bags and went to shoot a movie in America, at least once in my history as an Italian director, or better, one from Livorno. 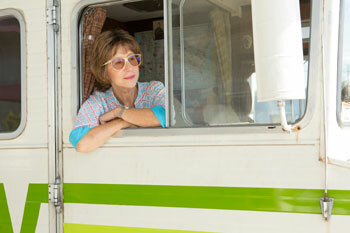 The Leisure Seeker explores the American "on the road" genre, updated by the ironic and compassionate poetry of Paolo Virzì and rendered even more extraordinary by the vitality of two exceptional stars, Helen Mirren and Donald Sutherland, in the roles of Ella and John, a couple on the run in their old camper. Paolo Virzì, who won a David di Donatello for best director with Like Crazy, puts his humour, his keen observation of social phenomena and a deep analysis of his characters into a movie which recounts the final, irrational and joyful adventure of an elderly married couple who are determined to avoid a destiny of medical care which would have separated them forever. "I have this bad habit of taking sad and distressing topics and trying to transform them into captivating adventures," says Paolo Virzì. "The secret is to combine comedy and tragedy, always." 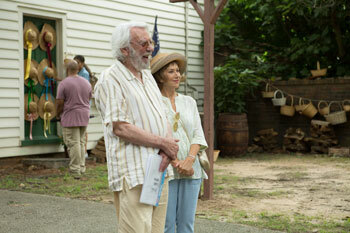 One thing is certain: The Leisure Seeker is full of both. "I was a little wary of a film focused on old age", reveals Helen Mirren, "but I looked at the work of Paolo Virzì, in particular Human Capital, and I thought he had a wonderful, humane, witty, easy way of approaching these complicated but very, very realistic human situations. Paolo's calling card is naturalism, human behaviour that can be silly or heroic but never melodramatic. I just loved his style." Donald Sutherland agrees: "Paolo Virzì is brilliant in the most subtle, complicated ways. The long and short of his sensibility, his understanding of the human condition, is that it is an epiphany." Recalling what had convinced him to accept the role of John, a retired teacher whose mind is crowded with pages and pages of books and is beginning to lose its clarity, Sutherland says: "I was probably 20 pages into the script when John sat up and started to talk to me. It was a wonderful conversation. He was very articulate. And very specific. And he liked the script." As to whether the setting of The Leisure Seeker is typically American, with its campsites, diners, theme parks and endless landscapes, Paolo Virzì says: "It's not like I was planning on transforming myself into an American director, or imitating American movies. I was trying to make my own movie, set in America, and I brought with me not only the main members of the crew but our 'Italian' way of observing things, as well. It isn't easy to explain just what this consists of; I'd say that, first of all, it's a sense of truth and cheekiness regarding human nature: not being afraid to explore the ridiculous side of life, which is something exhilarating and frightening at the same time, and it is this dual nature which I try to bring out in my films." The novel by Michael Zadoorian recounts a journey through the West along legendary Route 66 to Disneyland, but, Paolo Virzì explains, "It seemed to me that shooting in the grand locations of the Arizona desert or Monument Valley, iconic settings of many mythical films, was a way to get tangled up in a cliché, which is what happens to some American directors when they set a film in Italy and let themselves become enchanted by the picturesque and touristy surroundings. We explored less flashy locations which had something ordinary about them; visually, we were searching for the sweet, delicate and melancholy atmosphere that marks our story. As opposed to what Zadoorian does so well in his book, I felt I couldn't allow myself to be ironic about the more vulgar side of America, whose highpoint is Disneyland: I would have risked making a superficial parody, as an outsider. Moreover, by changing the socio-cultural background of the book's two main characters, we tried to somehow bring them closer to us, to create as much empathy as possible. In that regard, here's a small game we had fun with as we were adapting the book: we imagined a sort of myself and my wife Micaela, thirty years from now. He is verbose and grouchy, obsessed by the pages of the novels he has studied and taught to his students his whole life long. She is more lighthearted and always in a good mood, with something apparently frivolous about her. They are united by a passion which generated two children and a life together. The old Route 1, on the East Coast, has been less exploited in cinema and it has a fundamental meaning for our story since it ends at Key West, right in front of Hemingway's house, the author with whom Professor Spencer seems to identify." The screenplay was the outcome of the combined efforts of Paolo Virzì's tried and true collaborators. "I felt like I was joining a dream team of writers", recounts Stephen Amidon, the American novelist whose 2005 book, Human Capital, was adapted by Paolo Virzì into the film which enchanted Helen Mirren. Stephen Amidon and Paolo Virzì have become good friends and when Virzì's production company Motorino Amaranto and Indiana Productions – the producers of Human Capital and The First Beautiful Thing – decided to make The Leisure Seeker, Paolo Virzì asked Motorino Amidon to join the writing team. Virzì also collaborated with the Italians Francesca Archibugi, with whom he wrote Like Crazy, and Francesco Piccolo, with whom he wrote The First Beautiful Thing and Human Capital (Francesco Piccolo also happens to be working on the film adaptation of My Brilliant Friend by Elena Ferrante). And thus, a team of three Italian screenwriters began to collaborate with a bilingual Bostonian, who was in charge of supervising the authenticity of the language and a story imbued with American culture. "We worked kind of like a 24-hour factory," says Motorino Amidon. "I'd get up in the morning and they had written something, and then I'd work, and I'd send it to them – a real Socratic back and forth. It was very collegial." Motorino Amidon also worked as an American consultant during the location scouting and throughout the shooting. "Stephen would sit next to me at the monitor," says Paolo Virzì. "As often happens when you're shooting a scene – if there was something that needed changing in the dialogue, that had to be added or removed, I was comforted by the opinion and the advice of my Yankee writer friend. That said, it's impossible to feel completely out of place in America, thanks to all the movies and literature we fed on while growing up." Paolo Virzì's crew was composed primarily of Italians, including the cinematographer Luca Bigazzi, who is known in the United States above all for his work on The Great Beauty, which won an Oscar in 2013, and the costume designer Massimo Cantini Parrini, who had worked with Paolo Virzì as an assistant to Gabriella Pescucci on The First Beautiful Thing and who recently designed the costumes of Tale of Tales by Matteo Garrone. An American crew also worked with them; the American production designer Richard Wright helped Paolo Virzì find the balance he was looking for, straddling realism, adventure and family romance. "I like to fill the frame with realistic elements, with authentic faces that transmit a sense of truth," explains Paolo Virzì. "But above all, and this is a habit I think I have inherited from classic Italian cinema, I always try to connect the personal events of the characters with the spirit of the society at that particular moment. During the location scouting, I tried to absorb the atmosphere of that American summer and an inevitable part of it was the presidential campaign. There were posters and billboards everywhere, publicising both candidates, and it was obvious that the summer of 2016 was going to be 'historical.' I'm not clairvoyant, we couldn't foresee how it would end up in November, but what was going on struck me as very significant; it would affect the story of our two characters, who, in fact, are crossing an America they no longer recognise and which they seem to want to escape from forever." "The Trump rallies were in full flood while we were shooting," says Helen Mirren. "It became part of the script, a funny way of indicating something about John – as Ella says, 'You've been a Democrat your whole life, what are you doing?' 'But these people are so nice!' It was just a very sweet way of charting how John's mind was working at that point." "In the script, we never mentioned the word Alzheimer's; again, we were afraid of falling into a cliché. The children say 'Dad has his moments;' Ella says he has memory problems. Among ourselves, we called John's mental condition the 'Spencer Syndrome'," says Paolo Virzì. "This is backed up by the opinion of neurologists, who say that each individual manifests mental degeneration in his own way. John's confusion sometimes gives way to flashes of lucidity and in those moments we realize his charm and how painful it must be for Ella to be gradually losing her John." The character of John Spencer, in all his unpredictability, became almost a spiritual brother to Donald Sutherland, who declares: "I was just channeling John. It happens once it a while. Not often, certainly not all the time, but sometimes, and it happened in this film. John told me what to do, said what he wanted, remembered when he could and forgot when he couldn't. He got frustrated. I didn't. It seemed to me I was there for the ride and riding with Helen and Paolo Virzì, with everyone there, was a terrific trip." 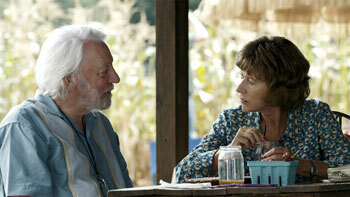 Donald Sutherland has rediscovered Hemingway: "Every one. The oeuvre. I hadn't been in there for fifty years" – and trusted the character of John to come through: "He took off, and I went with him." "The enthusiasm and passion with which Donald Sutherland dove into his character were moving," says Paolo Virzì. "He literally became a scholar of Hemingway and Joyce. He became John Spencer. An anecdote? When we had to take the camper back to the starting point for another take, Donald Sutherland didn't want a driver to do it, he wanted to do it himself. He was jealous of his camper, of his costumes, of John's glasses. I was enchanted by his devotion to the movie and to his character, who he didn't seem to abandon even off the set. He perfectly embodied the Actors Studio method, as it has been passed down to us by legend." "Helen Mirren," continues Paolo Virzì, "has a different approach which reflects her background as a theatrical and Shakespearian actress. She doesn't seem to take her character back home with her; she usually arrives on the set in an excellent mood and talks about other things: food, vacations, her house in Salento. But then, in front of the camera, she performs her impeccable takes, leaving us all speechless or exhilarated, and at the end of the day she goes away, saying simply 'Ciao darlings, see you tomorrow!' Besides being one of the greatest actresses alive, she is also a unique person: candid and sophisticated at the same time, extremely intelligent, highly witty, very easy-going with everyone, from the crew to the extras." "We called her The Queen," says Stephen Amidon. "Helen Mirren is the most professional human being I've ever been around. It was fascinating to watch the two of them together, because she's so classically Shakespearean and Donald Sutherland is so Method – but those contrasting approaches fit the characters so perfectly." "Actually, maybe they didn't even need a director," says Paolo Virzì, laughing. "Basically, the essence of our work, with my crew, was to try to always be ready to capture the grace and poetry which these two extraordinary artists are able to create on the set." "Ella is fiercely committed to life," says Helen Mirren. "She holds onto it tenaciously with full energy and commitment and joy. She hasn't withdrawn from life at all. You can see her resolve and her backbone as she puts on her lipstick and her wig, the uniform she puts on to face the world." Helen Mirren, who speaks excellent Italian, observed the collaboration between the crews from the two countries with interest. "I was truly involved and amused because I felt a bit American and a bit European." Paolo Virzì learned the hard way how to interact with the extras on an American production: "We carefully chose the walk-ons, the faces which appear in the election rallies and in the background of many scenes. We absolutely did not want to flippantly mock or ridicule this slice of the American electorate. One day, an extra was wandering around the set in an awkward and distracted way, so I suggested he do something, that he wave his hand and say 'Hi!' to someone. And this guy, amazed, ran to the assistant director and announced: 'I got upgraded, I have a line!' I didn't know that, according to the rules of the powerful American unions, if the director suggests a line to an extra, he promotes him to actor. We had to pay him another $1,000 for that 'Hi!' and I overshot our production budget that day." When scenes were being shot inside the Winnebago, the crew had to crowd into a very small space. "We were crammed into an old rickety camper without any air conditioning, in the gruelling East Coast summer temperatures," recounts Paolo Virzì. "I placed two fans right in front of John and Ella because it was the only way to get a bit of air inside that camper. We were all squeezed in there, to the point that sometimes it was too difficult and complicated to call for hair and makeup before starting a take and so I was the one quickly wiping Donald Sutherland's brow or our DOP Luca Bigazzi was putting the wig on Helen. Both of them seemed to like this rather gypsy-like atmosphere, like a neorealist film; they had good memories of filming the movies they had made in Italy." The director, the writers, the producers, the crew members and even the actors were truly fond of the characters John and Ella, the ailing yet intrepid married couple on the road. Helen Mirren concludes: "There's nothing quite like that later phase of love, when you know each other so incredibly well, you know each other's faults, you know each other's strengths, you know the other person so well that you know there are sides of them that you don't know – that's the process of discovering how little you can know another person. We are certainly looking at a couple who have been through all those stages and they are still in a process of discovery. They're an ordinary couple, these two. John and Ella are totally ordinary. You could look out your window and see a million of those every day – ordinary people – America is a huge country full of many families – nothing so special about them. They become special because we put a frame around them and we watch them. I think that's the great strength of Paolo Virzì's filmmaking – he makes films about people we can identify with. They are very, very human."